I had a great time at the Fringe tat weekend. Lots of good company and great classes. I taught most of the weekend but I was able to sneak in a class with Kay Judt! She is a great teacher and I learned a lot. We made her Twisting Star pattern. It has both the Dizzy Picot technique and onion skin joins. The best part is that she makes onion skin joins completely different from me. I think her way is something I will find extremely useful. I just need a little practice first so I'll be making lots of stars. I also did a little shoping. 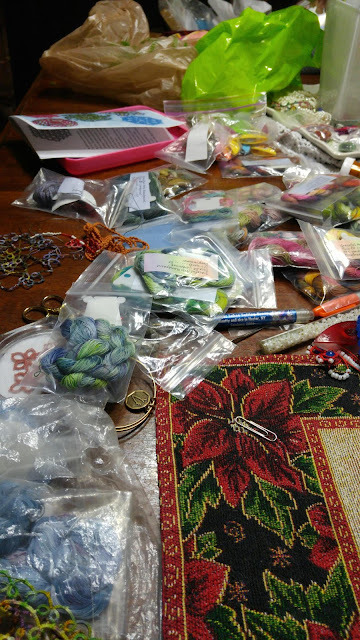 Its now confirmed that I have a stash of Karey Solomon's thread that will out last my hands! Fantastic! I had the pleasure of meeting Kay Judt several years ago. She is a lovely lade, and I'm sure she's a wonderful teacher. Have fun with your new treasures! Onion skin join is definitely a term I haven't heard before. Tatter's motto - she who has the most thread wins! Good to hear you made it home safe, loved seeing you again and enjoyed the class you taught. I saw you "helping" Karey set up her threads for sale. I did manage to get a few myself. Can't wait to see what you will tat with them.